In 2019, our new year’s resolution is to bring craft beer lovers the freshest, dankest IPAs. So we’re keeping things interesting with the Can-O-Bliss Series – a beery-go-round featuring three brand new IPAs – Tropical IPA, Hazy IPA and Citrus IPA – which will take turns blazing onto shelves throughout the year. That’s right – the type of IPA innovation you could previously only get in our taprooms will now be nationally distributed. The first release, Can-O-Bliss Tropical IPA, 7.2% ABV, is a juicy, sunset-hued rogue wave of tropical fruit flavors featuring clean, complex Mosaic, citrusy Azacca, fruity Galaxy, aromatic El Dorado and pungent Idaho 7 hops. We’ll round out the 2019 series by introducing Can-O-Bliss Citrus IPA, an intensely citrus-y and aromatic brew that will put zest to the test. 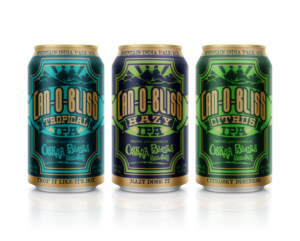 The Can-O-Bliss IPA Series will offer beer drinkers a variety of innovative IPA flavors throughout the year, showcasing unprecedented combinations of new and experimental hops from around the world. Stay tuned for release info and check out the beerfinder to find a Can-O-Bliss near you.